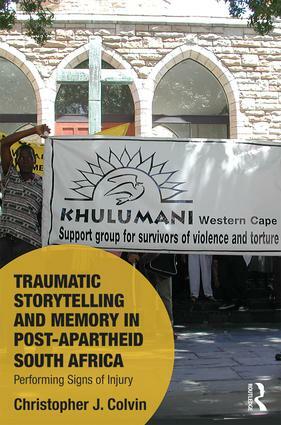 This book explores the practice of traumatic storytelling that emerged out of the South African Truth and Reconciliation Commission and came to play a key role in the lives of the members of the Khulumani Support Group for victims of apartheid-era political violence. Group members found traumatic storytelling both frustrating and yet also an important form of memory work that shaped how they saw themselves in the post-apartheid era. Drawing on ethnographic fieldwork, the author examines how traumatic storytelling functioned not only as a kind of psychological healing and national political theatre, but also as a potent form of social relation, economic exchange, political activism, and expressive practice. With emphasis on the personal, social, and political significance of the act of traumatic storytelling, this volume asks why members of Khulumani, despite their many disappointments, continued to engage intensively in storying their experiences for themselves and others. Examining what powers storytelling held for both group members and their witnesses, and considering the ways in which storytelling enabled new senses of self and new understandings of what was possible in the years after the end of apartheid, this book considers what we might learn more broadly from the experiences of Khulumani about the possibilities—and limits—of traumatic-memory-making as an instrument of personal, social, and political repair. As such, it will appeal to scholars of sociology, anthropology, and criminology with interest in justice and post-conflict societies. Christopher J. Colvin is an Associate Professor and the Head of the Division of Social and Behavioural Sciences in the School of Public Health and Family Medicine at the University of Cape Town, South Africa. Memory Studies as an academic field of cultural inquiry emerges at a time when global public debates, buttressed by the fragmentation of nation states and their traditional narratives, have greatly accelerated. Societies are today pregnant with newly unmediated memories, once sequestered in broad collective representations and their ideological stances. But, the ‘past in the present’ has returned with a vengeance in the early 21st Century, and with it an expansion of categories of cultural experience and meaning. This new series explores the social and cultural stakes around forgetting, useful forgetting and remembering, locally, regionally, nationally and globally. It welcomes studies of migrant memory from failed states; micro-histories battling against collective memories; the mnemonic past of emotions; the mnemonic spatiality of sites of memory; and the reconstructive ethics of memory in the face of galloping informationalization, as this renders the ‘mnemonic’ more and more public and publically accessible.